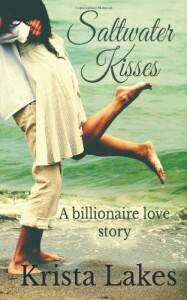 Saltwater Kisses: A Billionaire Love Story - This Nerd Loves Books!! Saltwater Kisses was a typical romance. The character's meet, they fall in love, then some kind of problem happens and they part ways, then they get back together and live happily ever after. Emma and Jack meet in the Carribean. Emma won a vacation through a radio contest, Jack was taking a last vacation before he was to take over his father's oil company. They have a week of lust filled days, and then, everything was supposed to go back to normal for the both of them. Different lives, different cities, different worlds really. That's not really how things turned out though. This book wasn't fantastic, but it definitely could have been worse.